Are you looking for a unique and fun corporate team building experience for your organisation in order to amaze, engage and inspire your team? Eng Chye can customise a presentation to suit your requirements which is designed to be a very interactive experience where the participants will learn how to think like a magician as well as some of the secrets to what they do based on his 'Team Building Magic' series. Whether you need a one hour or two hour presentation, Eng Chye will help you choose the right option for your next team building experience. 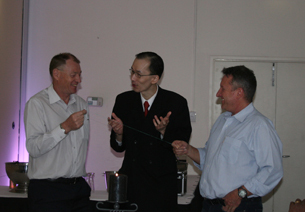 Eng Chye demonstrating his close-up magic to some executives at a management leadership event for BGC Contracting held at the Assured Ascot Quays Apartment Hotel in Ascot. 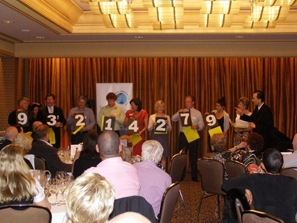 Eng Chye presenting his stage magic at a professional development event for the National Speakers Association of Australia held at the Hyatt Regency in Perth. As a magician and illusionist, Eng Chye has spent his life collecting and keeping secrets. However, Eng Chye has designed a presentation for organisations who'd like to have a unique and fun corporate team building experience for their teams. Eng Chye's presentations are unique and fun as he likes to share his experiences with people in a light hearted and fun manner, getting the participants involved and having a great time. During the presentation, teams will get a chance to work together in order to learn a brand new skill, to problem solve, to think creatively, to share ideas and to get to know each other a little better. Eng Chye will also share something which people always look forward to, his amazing magic and illusions. 'Team Building Magic' has been designed to be simple but challenging enough so as to allow participants to think like a magician and to challenge themselves in a way that they've never experienced before. 'Team Building Magic' is unique and fun and can be used to reward your employees, increase team morale or to strengthen the dynamics of your team. "Absolutely fantastic... made the evening both enjoyable and memorable... Eng Chye is very professional and spent a fair amount of time with myself prior to the function to understand what we were trying to achieve from a business perspective... his ability to then entertain and engage those attending was very much a highlight of the conference... highly recommended to anyone looking for a memorable evening of unique quality..."
"Brilliant... fantastic... everyone was totally astounded by both your close-up magic and your stage performance... had us all mesmerised... and had us all laughing... great audience participation..."
"Wonderful... everyone was amazed... I was very impressed at the way you spent time with each table and hearing all the gasps and clapping was proof of your amazing talent... I was personally in disbelief at the magic you showed me!... working with you has been a pleasure... you have been professional and courteous... everyone has since commented on how personable you were... I look forward to working with you for future events..."
"Our intent was to put the fun back into working for Jesters and you did this with the greatest of ease and professionalism... your show was truly entertaining and had us all captivated from start to finish... would be more than happy to recommend you to anyone looking for fun and enchanting entertainment..."
Training Manager, Jesters the Jaffle Pie Co.